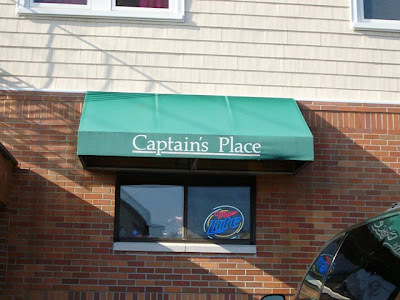 I've been reading a lot of good reviews about Captain's Place in Acushnet. 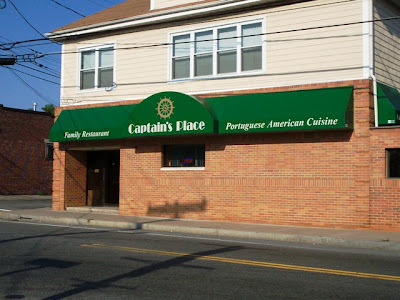 They're said to have great seafood and some fine Portuguese cuisine ( among other things ). So Saturday afternoon, around 3 p.m. ( our usual dining time ), we pulled into their parking lot. 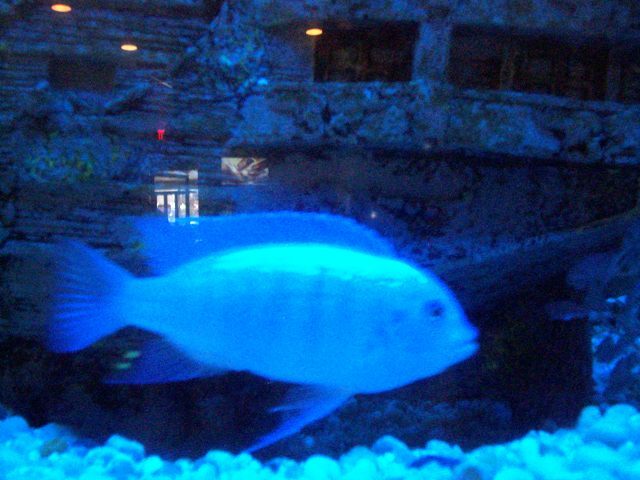 This fish was spitting out rocks the whole time! I'd heard this place was small and it was. A dozen or so small tables dotted the dark interior and there was a bar area off the side. This area tended to be quite noisy boisterous ( were there kids running around in there ? ). There were fish tanks lining the dining room wall but I felt kinda sorry for the fish. The tanks were a little cloudy, and having had tanks myself, I told Laura they could do with a good cleaning. A pleasant waitress named Carol came over to take our drink order and leave menus. We ordered 2 Diet Pepsis and took a look at the nice sized menu. It was a pleasantly diverse menu with appetizers that included shrimp, calamari, chourico and little necks. They have soups, salads and sandwiches and quite the selection of entrees like steaks ( prime rib, Portuguese style, shish-kebab etc. ), pork ( pork alentejana, cacoila etc. 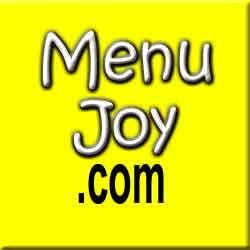 ), chicken ( Mozambique, Parmesan, Madeira etc. ) and fish and codfish dinners ( seafood casserole, little necks Spanish style, shrimp, scallops, tuna, swordfish and salmon, bacalhua and codfish gomes sa ) among others dishes. They even serve a nice children's menu with all their favs like hot dogs, spaghetti and chicken fingers. 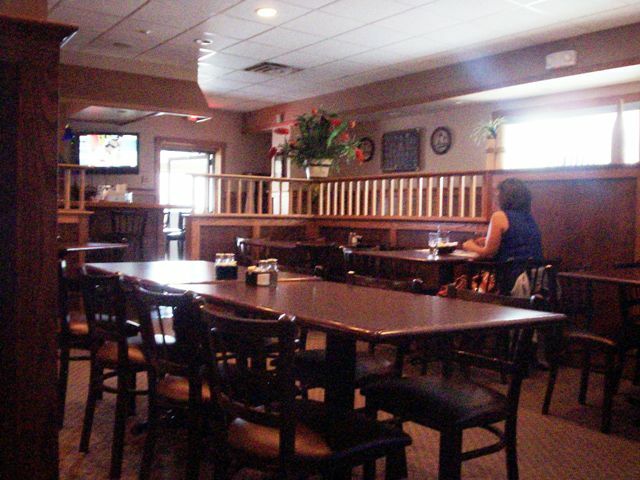 You can check out their menu by clicking here. When Carol came back with our sodas ( which had a funky taste, flat maybe ? ) we were ready to order. We saw chourico a bombeiro and got all excited remembering the last time we had it at another restaurant. 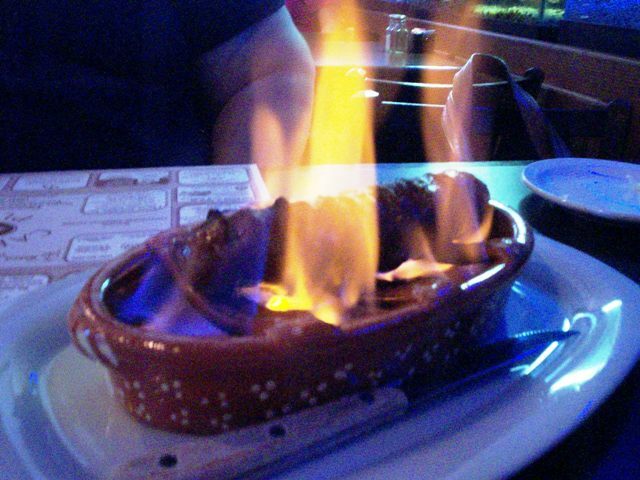 It had come spectacularly aflame and was so delicious. 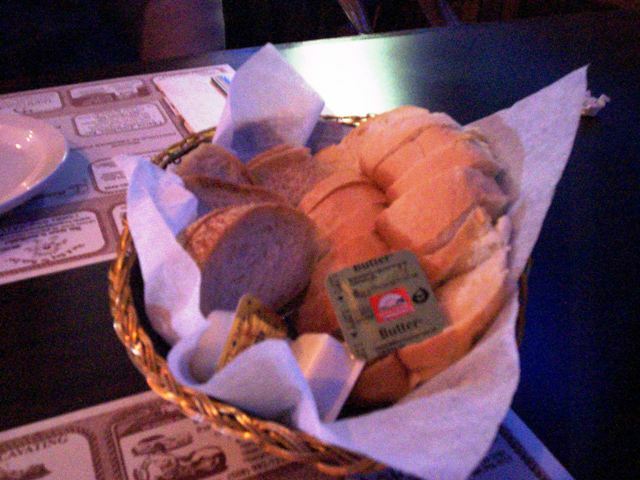 So we knew immediately that this was our appetizer. Laura then decided on the cacoila plate and I chose the Boston baked scrod. Soon after Carol took our order she was back with a really nice bread basket filled with slices of fresh Portuguese bread. Laura and I dug in while we waited for our food. It wasn't long before our chourico arrived. Indeed it was aflame, so aflame actually that we were afraid it wouldn't go out. As the flames got higher Carol said ," Watch out for your napkins. I think I put on too much alcohol." lol Laura and I struggled with the meat and finally got it off the fire and onto a plate. Whew, are my eyebrows still on ? I cut the chourico in half and placed one half on Laura's plate and we dug in. Hmmm, this chourico was quite fatty. The outside was nice and singed but the inside had chunks of gristle that were so unappealing. To tell the truth, the inside of the chourico tasted like it hadn't been cooked enough. It was a little disappointing. We finished what we could of the chourico and then our dinners arrived. 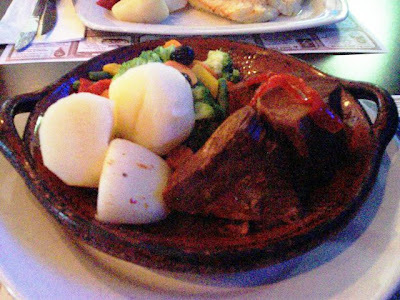 Laura had 3 large chunks of cacoila ( marinated pork ) on her plate along with some boiled potatoes and mixed veggies. She thought the sauce accompanying the meat was delicious. She also loved the boiled potatoes and 2 pieces of the cacoila. The 3rd. piece, however, had a lot of fat in it so she pushed it aside. The veggies were nothing special and actually looked like the frozen mixed veggies I find in the market. Laura said this meal was not what she'd hoped. When what you liked best are boiled potatoes, kinda sad. And although she found 2 pieces of the meat tasty, she also found them very stringy and was looking for a toothbrush after we left. My scrod was a nice big piece of white fish covered with bread crumbs. It was also accompanied by boiled potatoes and mixed veggies. Hey Laura was right those potatoes were tasty. Hmmmm, again boiled potatoes were the hit of the dish. My fish was very overdone and dry. If it had been done correctly, it would have been spectacular because the fish itself had a great taste. However it was way too dry and was not helped by the exceedingly dry breadcrumbs on top. 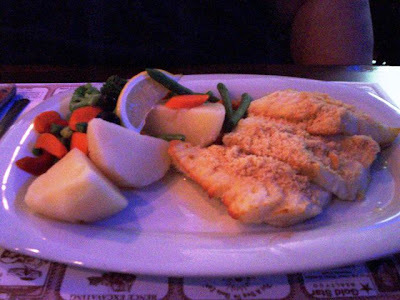 Usually the coating for scrod is crackers or breadcrumbs mixed with butter that enhance the moistness of the fish. But these were just dry breadcrumbs sprinkled on top that I could actually blow off. An otherwise great piece of fish was ruined with too much oven time and a dry topping. I also wasn't impressed with the veggies. But those potatoes were great. We had decided we didn't want dessert but, not to worry, we weren't offered any. Actually I don't know if they even have any. None are listed on the menu. We checked out the ladies room as we usually do and found it nicely stocked but in need of a floor wash. Other than that it was fine. I'd have to say the whole experience was a little disappointing. I know this is a very popular neighborhood place and I love that. But I guess the ambiance of eating with friends makes you overlook some little flaws. I know this place will continue to be popular but I don't think I would come again. But hey, I never say never. Do try it and see for yourself. With a tip for Carol ( a very nice and efficient waitress ), it came to $ 42. We left $32 plus a $10 gift certificate (from MenuJoy.com) on the table and headed out to our movie ( review to come soon ). P.S. There was this ( I think ) drunk guy. He was walking around visiting all the tables with his drink firmly in hand. He particularly seemed to be infatuated with a lovely older lady who was seated behind us. He kept talking with her and touching her hand. She, in the meantime, was giving the eye to her daughter. lol I think she was a little taken aback. Oh well, she's still got it. Captain's Place is open from 11 a.m. to 10 p.m. Monday through Saturday, and 11 a.m. to 9 p.m. on Sunday.